Psypoke - View topic - Infernape or Blaziken? Infernape actually has a higher special attack stat, but does not learn any Decent special attacks. You could go with Infernape, but Blaziken Can put a very large dent in any Team before it goes out. 284 speed isn't high. and you should as well know that. It depends on Abdallah026 for his team. Dose Abdallah026 need a pokemon favor in atk.? or a pokemon favor in Speed? INfernape beacause it can learn blast burn! I pray for the sake of humanity that you're joking. Blazekin. As a torchic he learned Ariel ace. Blazekin used that with an expert belt to OHKO infernape. I personally say Blaziken, he's a great mix sweeper, and because i just love the moveset i have on mine. Earthquake is a great counter against rock types and is a good psyical move. And Bulk Up allows me to sweep with EQ and HJK. Location: In a lake of LCL. Well I know blaziken is not fast but neither is Rypherior but it is still used. And speed is certianly not the most important stat and Infernape, even with that speed is still outrun by many pokemon. And I would like to revise the EVs on Blaziken to 252attack 252speed 6hp. And I guess you could make blaziken hold a choice scarf, but that would be a waste whaen you can take what it is good at and work it into a sweeper. Infernape I am not really a fan of, but if you like it use it but not as a mixed sweeper. Physical would be best because it has a larger physical movepool. I prefer Blaziken over Infernape. Infernape may be better, but guess what? I. DON'T. CARE. Blaziken was my starter pokemon, not to mention my all-time favorite. Truly skilled trainers should try to win battles with their favorite pokemon, not just choose them for their power. Blaziken will always be on my team, and no Infernape (or any other fire type for that matter) will ever replace him. Yay for Blaziken and the shameless 2 year necromancy to a dead thread. Blaziken as a personal favourite between the two and it being my 2nd favourite starter pokemon. It also has good overall stats in my opinion and good movepool. Well actually Diamond55000 if Blaziken and Infernape were in a battle Infernape would obviously go first and lets say it uses EQ (because Blaziken and Infernape can learn this) on Blaziken. Since Infernape's base attack isn't amazing Blaziken would probably live since it has decent defence ecspecially compared to Infernape. Then Blaziken would lets say uses EQ on Infernape. Since Infernape has like the worst defence of life and Blazikens attack is wonderful Infernape would die therefore Blaziken would win. This is supposing they are the same level, Beneficial Natures, EV's etc. 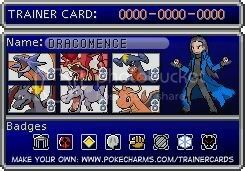 Yeah so i would pick Blaziken because he looks way cooler. Infernape looks stupid in my opinion (he looks like a roman monkey) Blaziken has better Defence's and attack. As said before Blaziken has a wider moveset. Due to movepool and stats nape is vastly superior. Blaziken's better, he has a good moveset if blaze kick and sky uppercut which can be complemented perfectly by mirror move which allows him to pwn dragon and rock/steel pokemon along with using blaze kick, if you need something with speed, just get a sceptile and trick it out with TMs. , if you need something with speed, just get a sceptile and trick it out with TMs.